TLC started production with Tyler Perry Studios on the network's first scripted series Too Close to Home, written, directed and produced by Tyler Perry. Production began this week in Atlanta at Tyler Perry Studios new studio lot located on the former Fort McPherson army base. The eight-part drama tells the story of a young woman who escaped her working class upbringing to discover unparalleled success in the fast-paced D.C. political circuit. Too Close to Home is slated to premiere later this summer. Danielle Savre will star as the lead Anna while Heather Locklear and Matt Battaglia join the cast as guest stars. 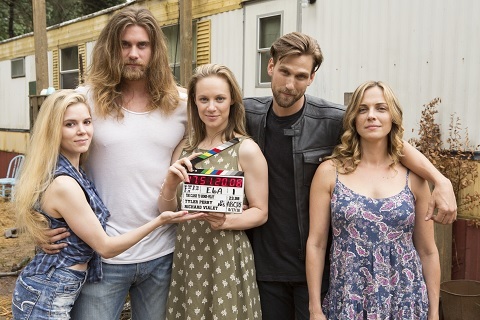 Cast in other leading roles are Brock O'Hurn, Kelly Sullivan (ex-Sage, The Young and the Restless; ex-Connie, General Hospital), Brad Benedict and Brooke Anne Smith. Series regulars include Alpha Trivette, Trisha Rae Stahl, Robert Craighead, Annie Thrash, and Curran Walters. Recurring cast members are Ashley Love-Mills, Nick Ballard, Charles Justo, Christian Ochoa, and Justin Gabriel. "We are thrilled with this dynamic cast for our first ever scripted project on TLC," said Nancy Daniels, President and General Manager, TLC. "Tyler Perry has proven time and time again that his characters are at the crux of great storytelling. Too Close to Home is yet another example of that, and we know our viewers will be enthralled with how this story unfolds." The story follows Anna, a young woman who escaped her working class upbringing in Alabama to start fresh in Washington, D.C. After making national headlines in a major political scandal involving one of the nation's most powerful players, she is forced to return to her roots and face a past she thought she left behind. Seeking help and forgiveness from the same people she abandoned for a "better" life, Anna finds herself right back where she worked so hard to escape... Too Close to Home.